The Eugene O’Neill National Playwrights Conference is one of the top playwriting development programs in the nation and is known for “developing new American plays that often go on to have a successful trajectory in the U.S. theater,” García-Romero says. Because the final public presentation is script-in-hand, García-Romero will be able to respond to these experiences by adding or changing a scene, rewriting lines or making other revisions right up to the last day. A scene from the student-driven workshop production of Anne García-Romero’s play Provenance. During the first year of her fellowship, García-Romero conducted research in Mexico, New York and California, then wrote the initial script and held a first table reading of the play. 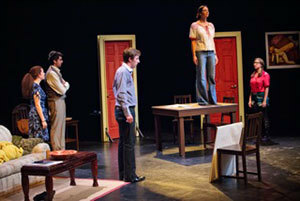 After more revisions, rehearsals began for a student-driven workshop production of “Provenance” in fall 2011 in the Regis Philbin Theater, which gave her an opportunity not only to see the script come to life for the first time but also to experience an audience’s reactions. In addition to the Eugene O’Neill National Playwrights Conference, García-Romero is preparing for the world premiere of her play “Paloma” at the National Hispanic Cultural Center this summer — and getting ready to teach two fall courses in Notre Dame’s College of Arts and Letters. One course will focus on contemporary Latina playwrights; the other, called “New Play Process,” will engage students with working playwrights who have offered to share their unpublished plays with the class. Originally published by Kate Cohorst at al.nd.edu on June 18, 2012.